From Big River Ridge Cottage you can take one path down to Big River (30 minutes) and another back up (60 minutes). There are official maps in the cottage as well as personal maps drawn by previous visitors. On the trip down, when you reach the end of the path, you will be at the ‘haul’ road. 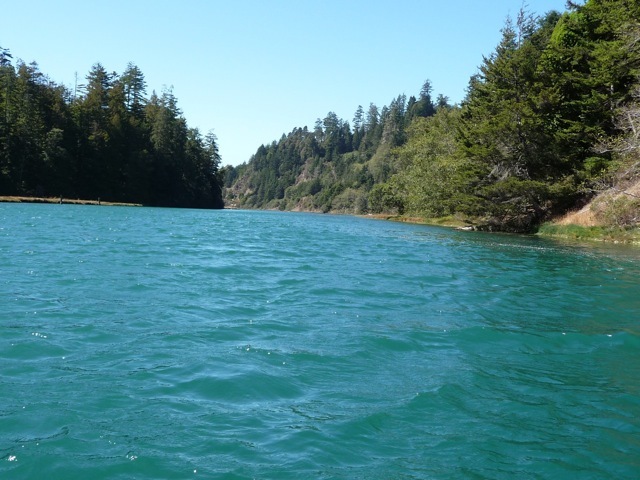 Turning right will take you in the direction of the log boom, farther west to Big River Beach State Park, and finally to the village of Mendocino (45 minutes on the ‘haul’ road). Or turn left on the ‘haul’ road and take the next path you come to on the left (about 20 minutes). Along the way you’ll recognize the picture above. At the top of the path you’ll see a telephone pole; turn left just past the pole onto the trail in the woods that will bring you back to your starting point. Big River is navigable inland 8 miles with lots of places along the way to picnic and watch the antics of the river creatures. If you don’t bring a bike or boat, visit Catch-A-Canoe & Bicycles Too on the south side of the river (take the first left after you cross Big River bridge, then again the first left down the hill to the shop) where you can rent bikes, canoes, outriggers, and kayaks. Bring your bike over to the north side to the ‘haul’ road to walk or bike alongside the river. If you go to the end of the ‘haul’ road (8 miles in from the coast), you can ford the river and enter The Woodlands, a WPA camp where you will be walking through some true Old Growth Redwoods. 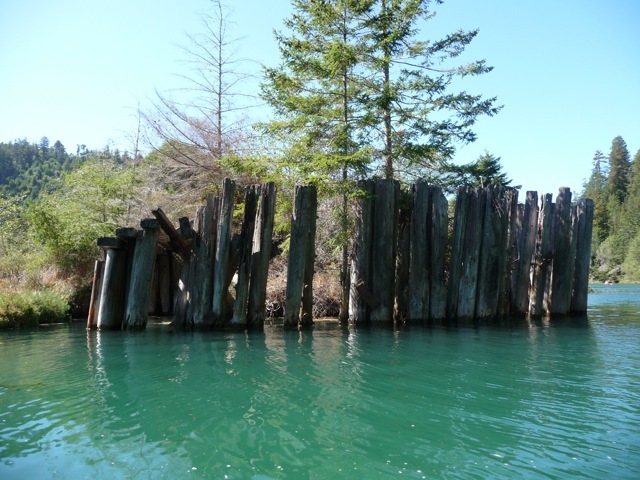 This is the log boom on the south side of Big River about 2.5 miles inland from the coast. Our land sits in forest clearings on the north ridge above Big River’s ‘big bend’. There are two main pathways to the river. The path down that I described above is the same route taken by loggers and their oxen dragging trees to the log boom for holding, then letting them loose to float downriver to ships waiting at the mouth of the river in Mendocino Bay. The boom is the deepest and widest swimming hole in the river. You can sit on the massive timbers of the boom and watch river otters, Blue Heron, ducks, and sometimes even seals. Have a snack; jump in for a swim. When we first moved here in 1972, the path to the river was grown over from the old logging days to become hardly more than a deer path. It wound through the pristine second growth forest and the remains of the huge old first growth trees. By mid-1972 the forests were logged again and the paths turned into skid trails for the equipment that replaced the oxen. Landings on the hillside were created where the trees were held for the logging trucks. Both landings and paths today are beginning to grow over but are still easy to navigate. Wear long sleeves for some areas where you’ll find sharp grasses in the path. 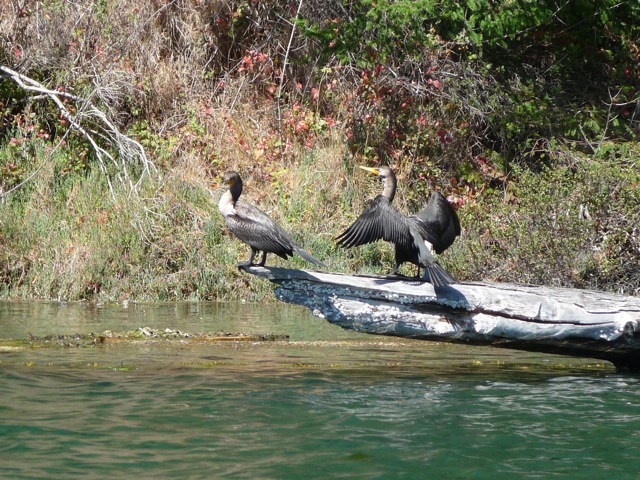 Winged Ones sharing the point of a fallen tree, “a floater”, on the river.